So this was a huge step up since my first Esther costume! I still plan on re-doing it AGAIN, because I am crazy… But hey, I strive for perfection! There have already been two versions, I’ll condense both here. I debuted the first one at Katsucon 2008, but the second and better of the two at Otakon 2008. I love this outfit so much, I did most of it base off of the gorgeous Thores artbook pictures, so a lot of it was up to my imagination. Regardless, I love Esther, always will! Next, I’ll do it over again with her sawed off shotgun and a few other awesome extras! Again, no patterns were used for this at all, and I graduated from hand sculpting to casting! 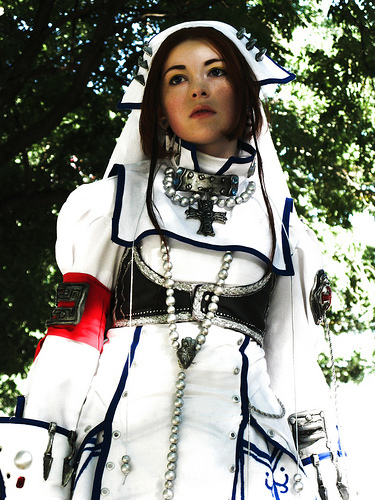 I few pieces were recycled from the novice uniform to use on her AX nun uniform. A lot of hand painting was involved however, aging, detailing and blue paint to complete her underskirts, armour and various other aspects of the outfit. This was a costume that took hours and hours, making molds, casting, painting, I would say upwards of 70+ hours went into this baby? Probably even more… I blocked most of it out of my memory! I did also create parts of the Seth Nightlord costume in these pictures as well as worn by Jennie Frey… I made the hat, the jacket, and helped a lot with the train and skirt parts… God, that outfit was soooo insane! Won Honorable Mention at Katsucon 2008 in the Hall Cosplay.